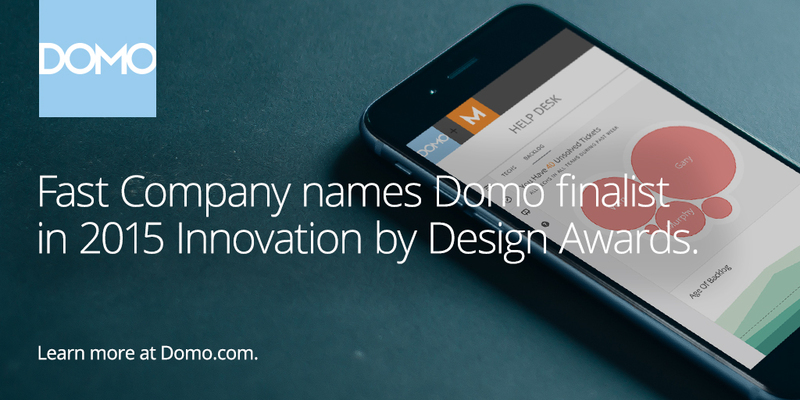 SILICON SLOPES, UT--(Marketwired - September 24, 2015) - Domo, provider of the world's first business management platform, today announced that it was recognized by Fast Company in Fast Company's 2015 Innovation by Design Awards. The 2015 Innovation by Design Awards bestow honors on designers and businesses that have worked together to solve the problems of today and tomorrow. The judging panel, comprised of the world's best design minds, selected honorees from among 1,500 international submissions across 14 categories. This year's competition will showcase the addition of the 3-D printing, fashion, smart home and web design categories. Domo was named a finalist in the Data Visualization category for its cloud-based business management platform, which enables CEOs, managers and employees across an organization to make faster and better-informed decisions. Entries are judged on their functionality, originality, beauty, sustainability, depth of user insight, cultural impact, and business impact -- the key ingredients for any innovation. Finalists are featured in the pages of the October issue of Fast Company magazine and on Co.Design. Winners will be celebrated at Fast Company's 20th anniversary celebration in New York this November. A full list of all the Innovation By Design winners can be found on the Fast Company website.